Vertical blinds are a very popular type of blind, as they are easy to install, are both functional and fashionable and come in a wide range of designs. They’re perfect for large windows – even floor to ceiling ones – and are extremely simple to use. They give you options of how you want your blinds to work (for example, sliding to the left, right, or parting centrally down the middle), as well as allowing you to tilt the vanes of the blind in order to control the amount of light that is let in (this also increases privacy). How do they work? Vertical blinds are made up of several fabric vanes which have weights attached to the bottom to ensure that the fabric retains its shape and that the vanes stay perfectly parallel to each other. You can open and close the vanes using a cord fitted to either the right or left hand side of the window, as well as tilting them when you want more or less light to enter the room. Vertical blinds are often cord operated, but they do come with tie-backs to keep the cords out of reach of children or animals, so you can rest safe in the knowledge that they pose no risk to your loved ones. 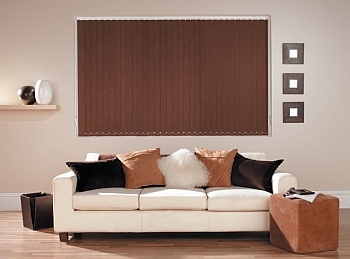 Vertical blinds fit well in any room of your home or workplace. Whether you want the blinds for work or if you have a home-based office, vertical blinds can help you cut down on disruptions – not only do they give you privacy, but they can also stop bright sunlight from filtering in and producing glare on your laptop or computer monitor. As vertical blinds are made to measure, they are perfect for fitting all kinds of windows, no matter what size or shape. 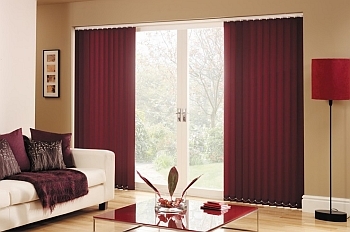 This means you can make use of these blinds in the bedroom, the lounge, and even the conservatory, where they can help to regulate the temperature during the colder times of the year. They are also incredibly easy to look after – vertical slats catch less dirt than horizontal ones and can be easily cleaned with a damp cloth. As they come in a wide range of fabrics, you’ll have no trouble finding vertical blinds that will complement the existing décor in your home and office, while still remaining convenient and easy to use. They aren’t just available in fabric, either; vertical blinds also come in the form of vinyl, wood, and aluminium vanes, allowing you to really match your window treatments to the style of your home. You can also get vertical blinds with a range of different features depending on your requirements, from blackout blinds to fire-retardant and solar-protective coatings to make them last longer and to give you that extra peace of mind.